For this design I used two nail polishes by OPI, namely "Is Mai Tai Crooked?" and "You're Such a Budapest". 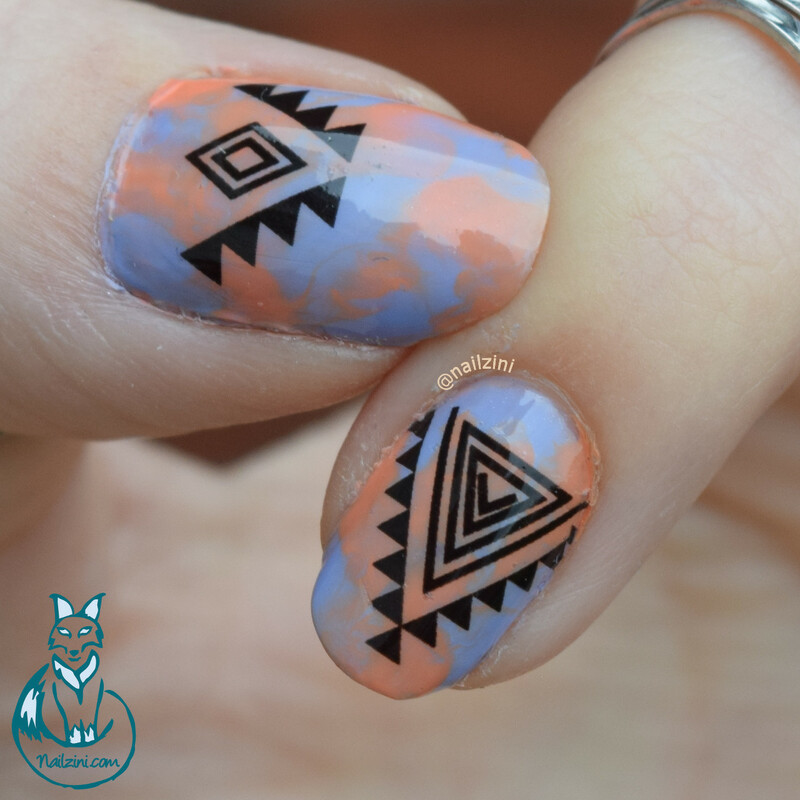 Besides being the first time I used water decals, this is also the first time I tried to dry marble with a stamper. I know right, lots of firsts here! 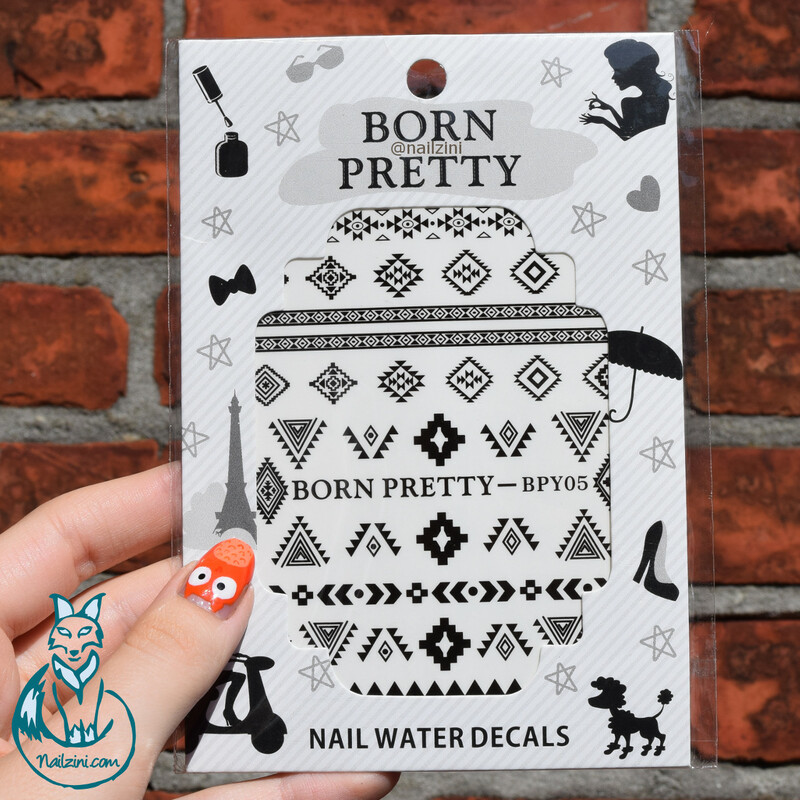 The stamper I used is the Silicone Jelly Stamper (ID=26498) by Born Pretty Store. 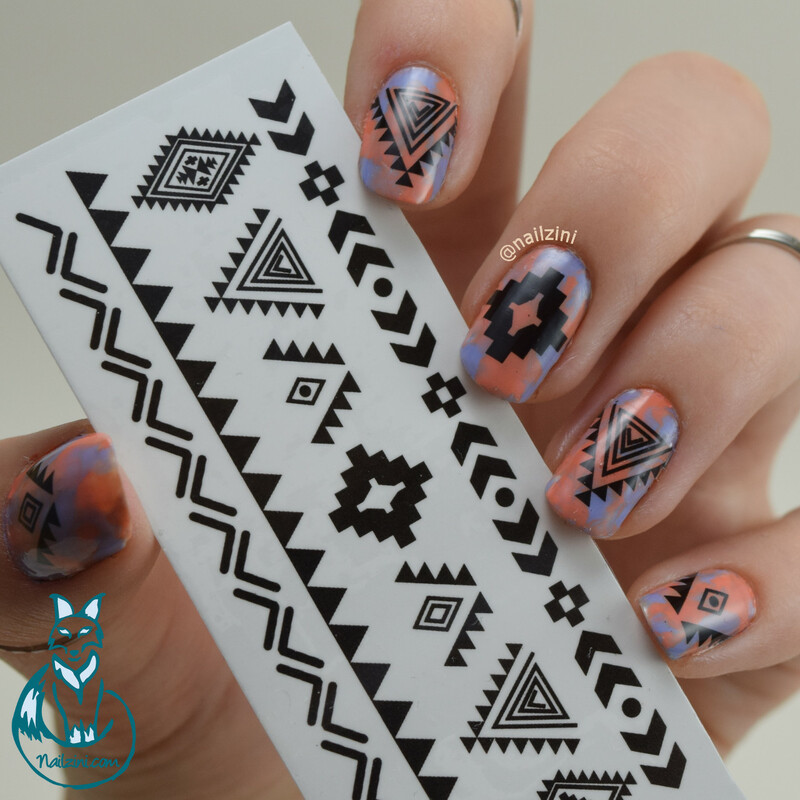 To do dry marble with a stamper you apply some drops of the different colors on the stamper and then gently press it on your nail. (You can see how I did it in the tutorial) Since it's my first time doing this I tried two different ways. I found that doing only one coat wasn't enough to have full coverage so on my thumb I applied two coats with the dry marble technique and on the rest of my nails I first applied one coat of "You're Such a Budapest" and then dry marbled on top of that. You can see, or not see, the difference in the picture above, but I found the effect to be quite similar. I would probably use the second method and only dry marble once since it uses less polish, which I hope dries a bit faster as well. 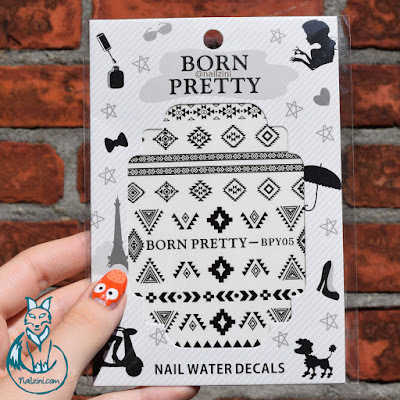 These decals are triangle diamond shape nail water decals (ID=33970) by Born Pretty Store. Such a long name! I'm just going to rename them to tribal decals for now. 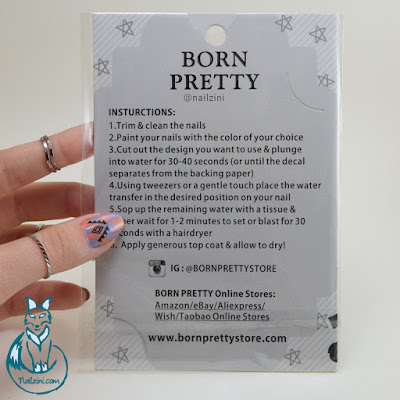 I really like Born Pretty's items but their names aren't always the easiest or the shortest. :D Anyway on to the review! 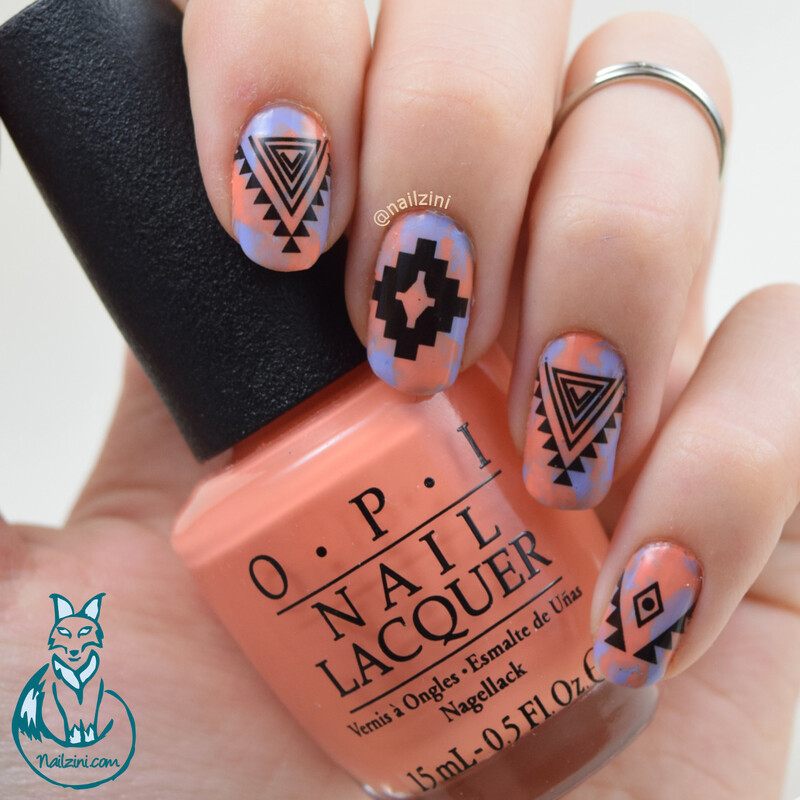 This product contains one sheet with the patterns shown in the photo above and comes in a cute little package. There are 11 different standalone decal designs which each have one double, with exception of the designs in the center of which there are 3. Besides these there are also 4 line decals. The standalone designs are quite big, or at least for my thin nails. I had to cut a little of the sides of 3 of the decals because they were a bit too big, but it's always better to have too much than too little! The package comes with instructions on how to use them on the back, so no need to go google anything! I followed them almost exactly and it turned out perfectly. One thing it doesn't mention though is to take of the protective film after cutting out the desired decal, but it pretty much comes of on its own anyway. Then it says to soak the decal in water, so I tried out both lukewarm and ice cold (literally with ice) water. Both seem to work perfectly fine and you can easily separate the decal from the backing paper after 30 seconds. 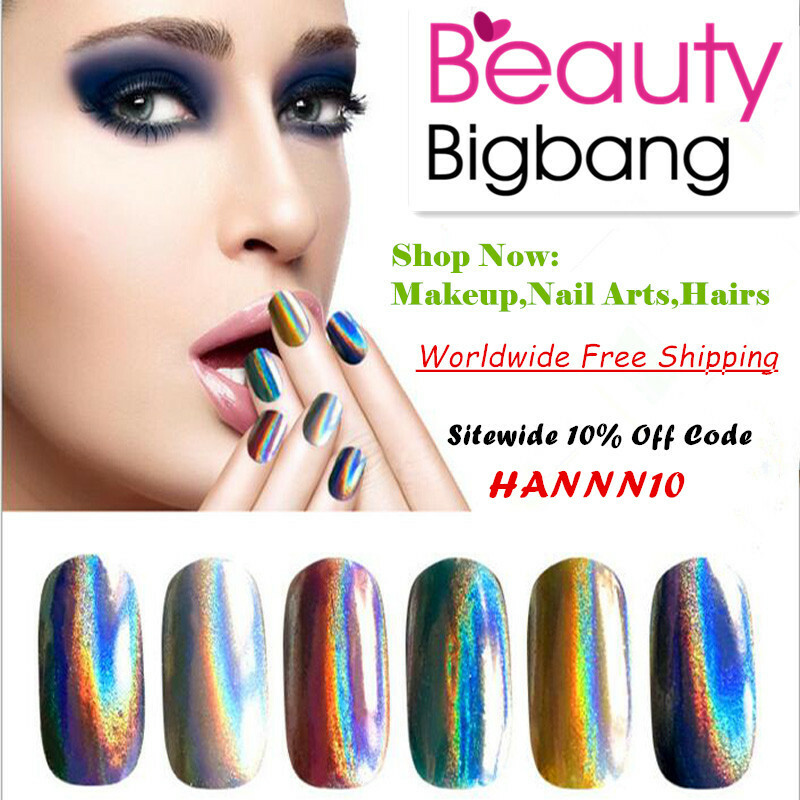 After placing it on your nail, you can still move it around a bit with your finger or tweezers to find the perfect spot. When you've sopped up the water with a paper tissue it stays on really well, so make sure you've moved it to the right place before doing this. Then apply a top coat and voilà, you're all done! If you want to see the whole process you can watch my tutorial below, enjoy! Conclusion: these are pretty awesome! Whether you use one decal on an accent nail, place one on each nail, apply them on top of a gorgeous nail polish or on a patterned background, they are a great way to complement your mani. 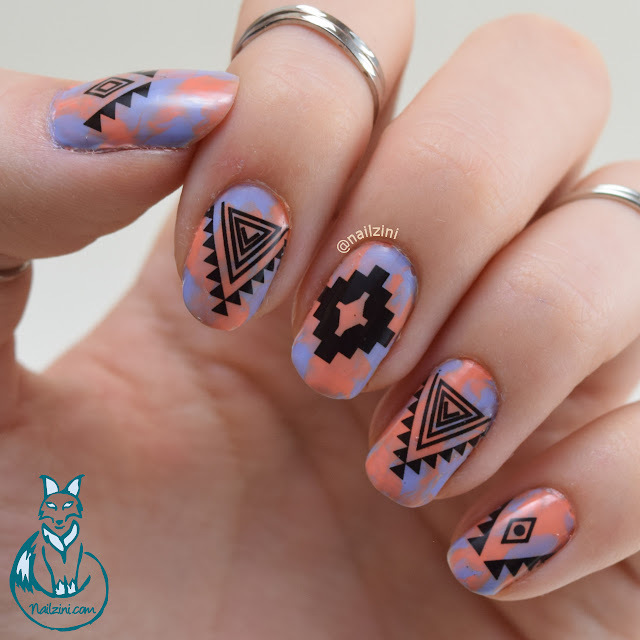 It's so much easier and faster than hand painting your own tribal designs.